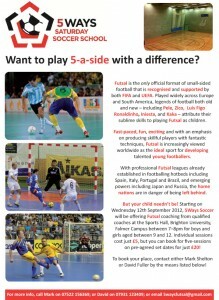 5Ways Futsal delivers FA qualified Futsal coaching for children aged 9-13 years in the Brighton and Hove area. Sessions are held at Brighton University’s newly developed Sports Centre facility on Wednesday nights though out the year and aim to introduce this excellent form of the game to local young players of all abilities. Futsal is recognised and supported by both FIFA and UEFA and is played widely across Europe and South America. Fast-paced, fun, exciting and with an emphasis on producing skilful players with fantastic techniques, Futsal is increasingly viewed worldwide as the ideal sport for developing talented young footballers. Legends of the game such as Pele, Luis Figo, Ronaldinho, Iniesta, and Kaka – all attribute their sublime skills to playing Futsal as children. Put simply, Futsal is a 5-a-side game of football played on an indoor pitch using a smaller ball that has a lot less bounce than a normal football. The small sided format, perfectly flat playing surface and modified ball encourages participants to keep the ball on the floor, use short quick passes and develop good close control and inventive footskills. It is widely regarded as the best form of the game for encouraging excellent technical development in young players and futsal matches are known for being high scoring, fast-paced and full of tricks and showmanship. Ages: 5Ways Futsal is currently only open to children aged from 9-13 but please feel free to register your interest if you have children outside of this age group as we may be able to run new sessions if the demand is there.